Former PM Tony Blair has been asked to give evidence to a parliamentary committee investigating the failure to award compensation to UK victims of Libyan-sponsored IRA violence after a reparation deal was struck with late Libyan leader Muammar Gaddafi. Westminster’s Northern Ireland Affairs Committee has asked Blair about his involvement in negotiations that led to a compensation deal between the US and Libya in 2008. US victims of terrorism were compensated £1 billion in return for Libyan immunity from terrorism-related lawsuits, effectively invalidating the claims of British victims who were suing Libya in US courts. Lawyers for UK victims of attacks in which Libyan arms were used said Blair had “questions to answer” about why they were locked out of the deal amid speculation lucrative business agreements got in the way. Gaddafi, who was killed during the Libyan civil war in 2011, supplied weapons and Semtex explosives to IRA militants during the Troubles. Northern Ireland Affairs Committee chairman Laurence Robertson said he hoped Blair could shed light on the issue. “There is a real sense amongst the victims that an opportunity to include them in the agreement reached between the US and Libya was missed in 2008. The committee is keen to shed some light on this and in so doing maybe provide some kind of closure for the victims. “As you are no doubt aware, there has been a lot of concern voiced as to the nature of any involvement you may have had in negotiations between Libya and the US in the run-up to the signing of the US-Libya claims settlement agreement, which precluded the provision of compensation for the UK victims,” he added. 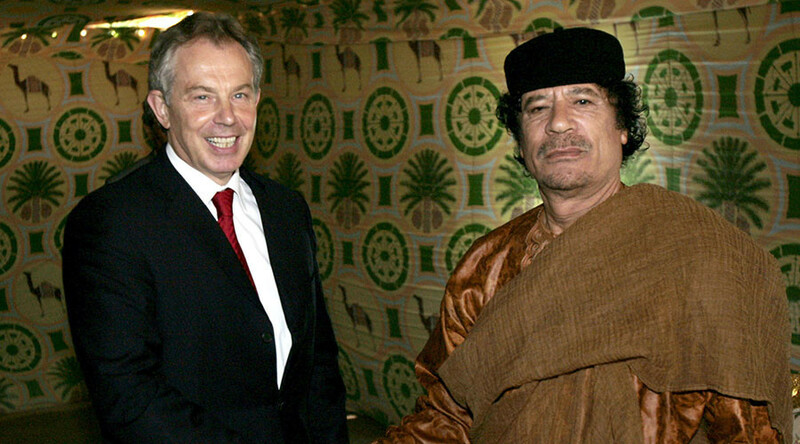 The committee has been handed a copy of an email sent to Blair’s office by the then ambassador to Tripoli, Sir Vincent Fean, in 2008, a few days before Blair met with Gaddafi in Libya. According to a lawyer for the victims, the message indicates Blair was involved in negotiations for the compensation deal. Blair has been asked by the committee to submit written evidence by October 23. Robertson said the former PM could be asked to appear before the inquiry to answer questions in person. McCue welcomed the call for Blair give evidence as a “great step forward” that could help clear up the question of whether the victims’ rights had been sacrificed for business deals. “The United States, as well as Germany and France, all managed to secure their business interests without relinquishing responsibility and respect for their own citizen victims,” McCue said. “Government departments ever since have been unable to explain why it is that the UK’s victims of the IRA have been prevented from gaining compensation, as other countries have, from Libya. “The lives of the UK victims and their families seem to have been sacrificed for the benefit of half a billion pounds’ worth of celebrated business deals that never fully transpired. Blair’s answers may be the key to revealing finally how this failure of duty of care transpired during his government, and successive British governments,” he added.